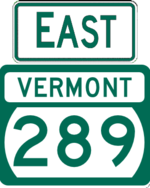 VT 289 is a two-lane nondivided freeway bypassing the VT 2A, VT 15, and VT 117 intersection in Essex Junction and the only freeway in Vermont with mileage-based exit numbers. The original plans included extensions to VT 127 to the west and I-89 to the south/east. These extensions are cancelled, but the eastern one may get built eventually due to traffic to/from IBM. 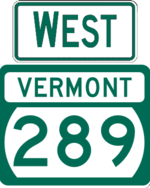 Despite rumors, VT 289 was never intended to be I-289.